Installing swing hooks in our playroom was genius. Doing so has allowed us to do occupational therapy activities at home, provide vestibular sensory input to my vestibular sensory seeker, and burn off energy on those frigid winter days. Yesterday was one of those frigid winter days, so I swapped out the swings (we have a few!) and hanged our round platform swing up for my four year old. He then immediately started doing this directional swing game. His little game is a good core workout, I tell you! I, of course, had to try it out and well, it wasn't pretty. However, for little people with a shorter center of gravity, it's much easier. 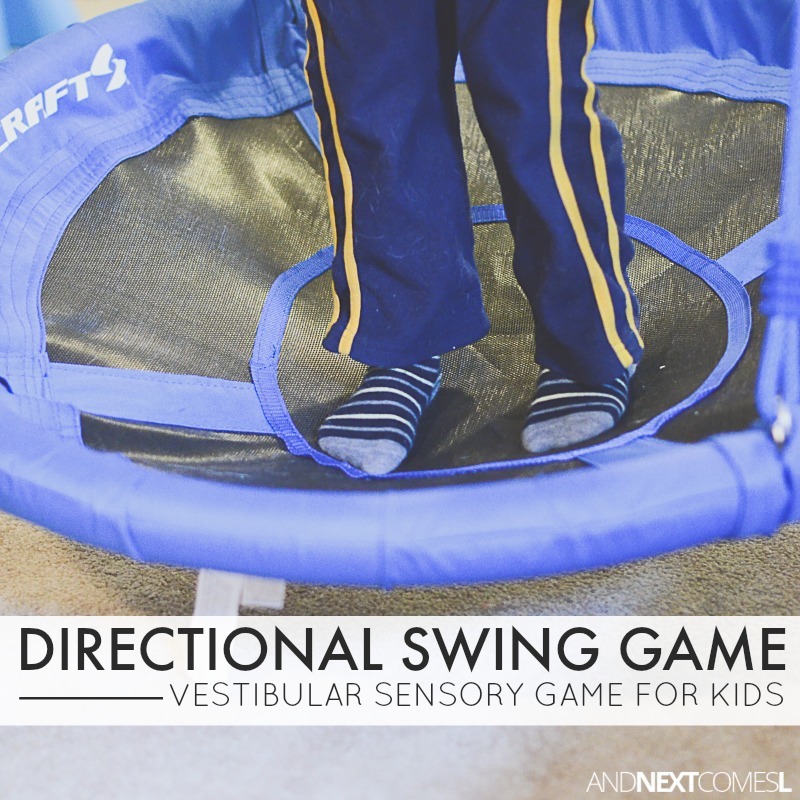 Anyway, this swing game provides lots of vestibular sensory input and reinforces the concepts of directions like left and right. Safety first. Only you and your child know what your child is capable of. Do not use a homemade or DIY swing for this activity. 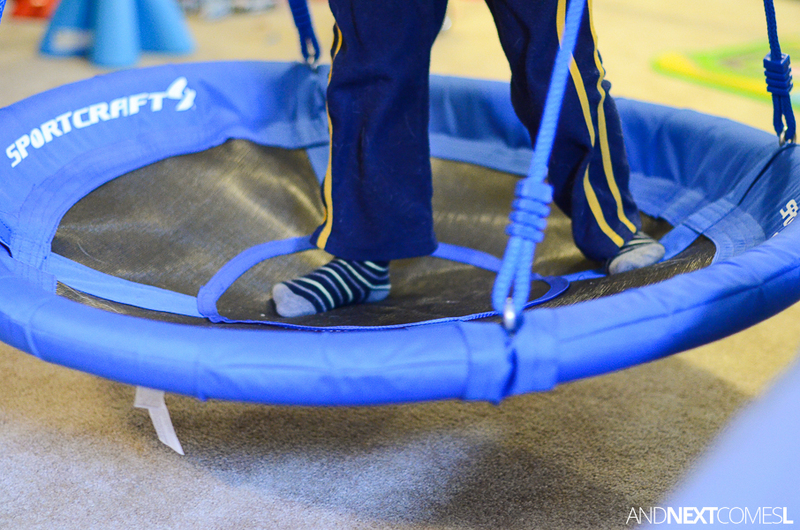 Use proper safety measures like exercise mats underneath the swing. The swing should be low to the ground and the child should be able to get on or off of the swing independently. Your child should use two hands at all time. Now, I want to mention that this game was something that my four year old did on his own. I believe and trust in my children's judgments and allow them to take risks. He obviously felt comfortable enough to initiate this game on his own, so I followed his lead. And then I grabbed my camera to record what he came up with. That's why it's important to always keep your camera close by for moments like these. A platform swing - Ours is a round Sportcraft swing that I purchased from Costco.ca for less than $50! If your swing is similar to ours and has identifiable sections, then you are ready to go. Otherwise, use masking tape or painter's tape to mark sections on your platform swing. Your child stands on the swing, holding tightly onto the ropes with both hands. Simply call out a direction (left, right, middle, forwards, backwards) and have your child move their feet accordingly. You can make it more complex by stating two different directions, one for each foot. Here's this activity in action and as you can see, my four year old seems to have a pretty awesome grasp of the concepts of left, right, middle, etc. 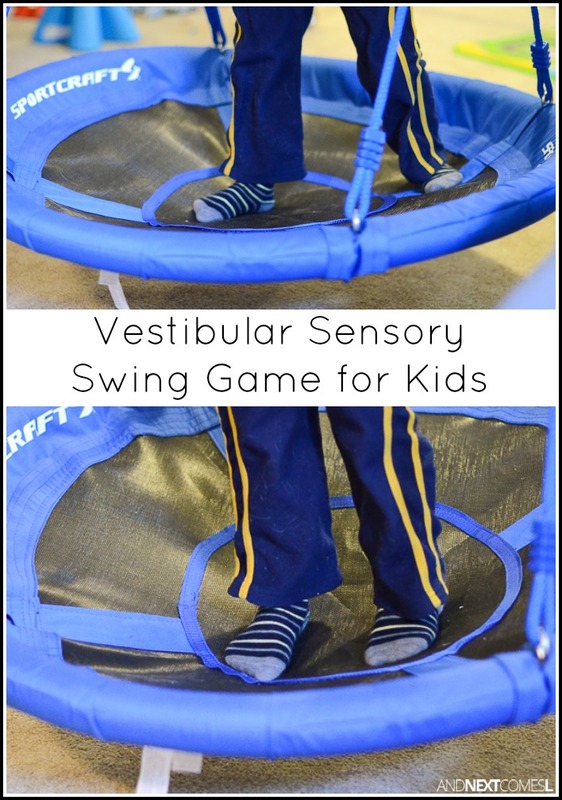 You could also try this activity using trapeze hooks or gymnastic rings and tape. Mark spots on the floor with tape for left, right, front, back, and middle. Then your child hangs from the swing and tries to move their body in the direction requested. Then they can try to set their feet onto the taped off spots. Speaking of swings...have you tried one of these DIY swings yet?